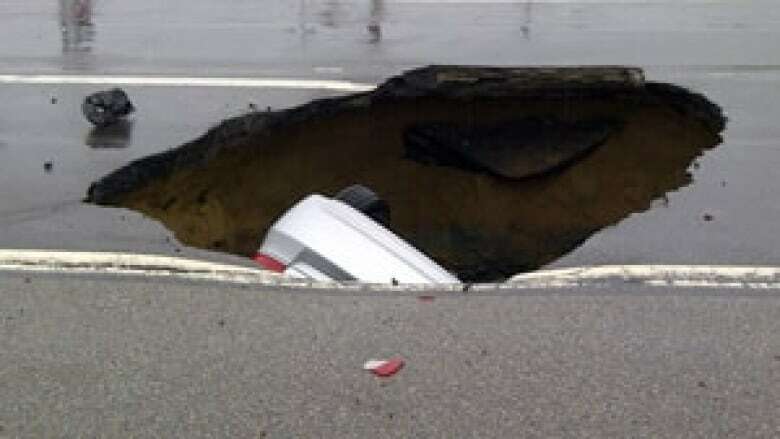 An Ottawa man escaped a highway sinkhole, which has grown to the size of an "Olympic-sized pool", after his car was swallowed during afternoon rush hour Tuesday. An Ottawa man escaped a highway sinkhole, which has grown to the size of an "Olympic-sized pool", after his car was swallowed during afternoon rush hour yesterday. 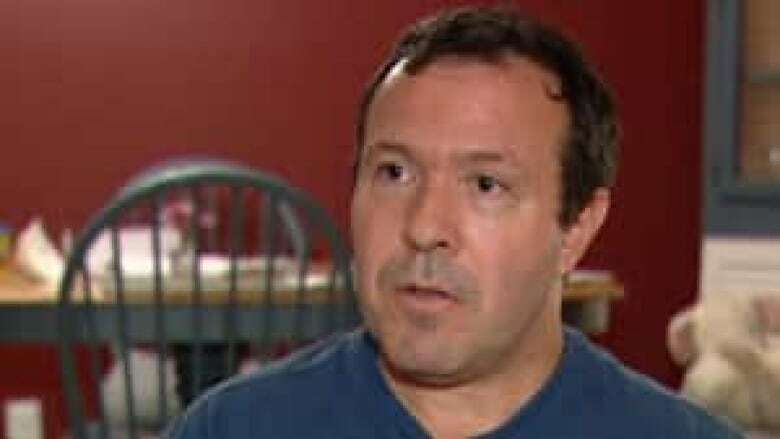 Juan Pedro Unger told CBC News he was driving home eastbound on Highway 174 in the east Ottawa community of Orleans when he saw a black patch ahead in his lane near the Jeanne d'Arc Boulevard exit. At first, Unger said, he thought it was a tarp. But when he discovered it was a large hole, it was too late to stop. "I couldn't make a radical manoeuvre, it could have caused an accident," he said. "I just tried to come to a stop, but I couldn't and it just sunk in." Unger's silver four-door sedan went nose first into the sinkhole just after 5 p.m. ET Tuesday. He said there was a large banging sound as the car rattled around in the hole. Only its bumper did not go below the surface. Unger hung from his seatbelt and he said he thought of two options — either try to get out, or stay in the car and wait for help. At first, he feared a bus or car would come along and land on his car. But then he also recognized there was eroding water and pavement beneath him, and he feared the vehicle could sink further. "There were two big gaps with water flowing into them like a river was forming, and completely pitch black under it," Unger said. "Those two holes, you couldn't tell how deep they were. They could be a metre, they could be 100 metres." Unger managed to get his door open and he crawled out, using the door to prop himself up. He began to climb through the hole when two witnesses reached in to help him out. "It was a huge relief to be out and alive," he said. The sinkhole will take days, not hours to repair, staff told the city's transportation committee Wednesday. Contractors had begun to assess the sewer pipe Tuesday as part of a $1.5-million repair job. Staff said workers need to replace the approximately 50-year-old, 3.6-metre-wide sewer pipe that cuts across under the highway. Unger's vehicle also remains 20 metres down an underground sewer pipe flowing towards the Ottawa River. The city's environmental services department says there will not be environmental damage caused by the sinkhole or the vehicle. Staff are currently using dikes at the sewer outflow to prevent car contaminants from entering the sewage system. The eastbound lanes of Highway 174 remain closed between the Blair Road and Jeanne d'Arc exits. Officials say the closure could last days, or maybe even weeks, for the repair to be completed. Tuesday night's rainfall also made the assessment of the sinkhole more difficult for the excavation company.